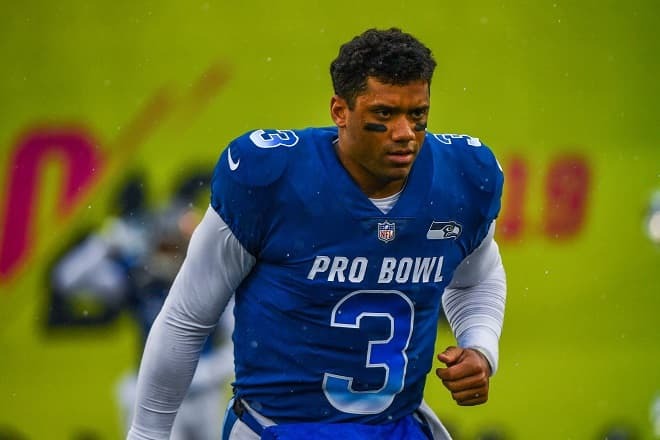 Russell Wilson is a professional Seattle Seahawks football player from the USA. He was born on 29th November, 1988 in Ohio, which means that his age is still 30. He is of African-American ethnicity. Being tall and standing at 5’ 11” height, he is great for the position of a quarterback. His jersey number is three. He was on the fence about which sport to play, football or baseball, and in the end opted for football because it was more “challenging”. He was born and raised in Richmond, Virginia. His parents have always been very supportive. His mother’s name is Tammy Wilson and his father is Harrison Wilson III. He started playing football when he was only four years old. He took after his dad when it comes to his athletic talent, since both his father and grandfather played football and baseball. He has an older brother named Harrison IV and a younger sister Anna. He started his sports career back in 2006 when he enrolled at North Carolina State University. He received formal education at this college, and obtained a degree in Broadcast/Communication, and a master’s degree in Educational Leadership and Policy Analysis at the University of Wisconsin. 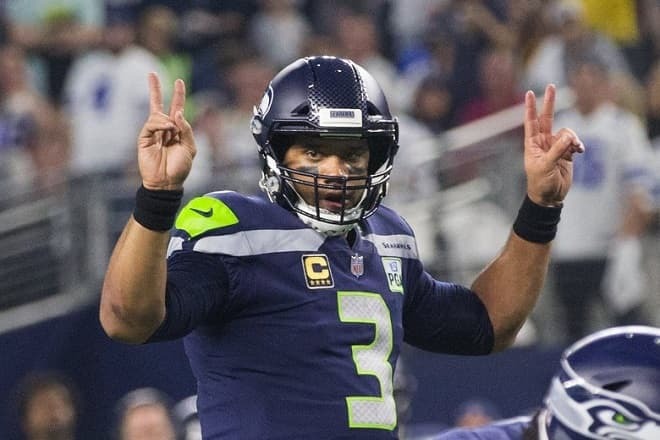 As far as his football career is concerned, in 2012, he started playing for the Seattle Seahawks who signed him on a four year contract. In 2010, he played for the Colorado Rookies. The scout who followed him since his high school years and believed in him was Jay Matthews. However, he chose football over baseball. He married twice. His ex-wife is his high school sweetheart Ashley Meem. The couple separated after two years of marriage. There were no kids in this marriage. After his divorce, he dated his girlfriend Ciara for a year before tying the knot. Their wedding ceremony was lavish and held at a castle in England. He is now married to her and they welcomed their baby daughter Sienna Princess Wilson in 2017. 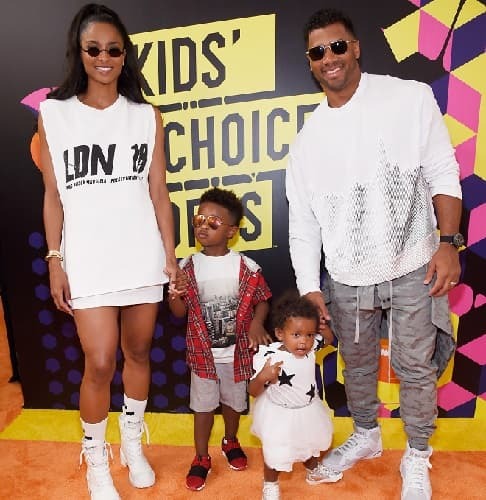 Ciara has a son from a previous relationship with the rapper Future. In 2018, Russell and his wife Ciara purchased a beautiful Bellevue house for $6.7 million. From 2014, he is a co-founder of a bread company named “Eat the Ball” and the owner of his clothing line “Good Man Brand”. He has appeared in many famous magazines and shows such as “Late Show with David Letterman” and “Jimmy Kimmel”. He supports a lot of charities. Some of those are “Autism Speaks”, “Bill and Melinda Gates Foundation”, “Celebrity Fight Night Foundation”. 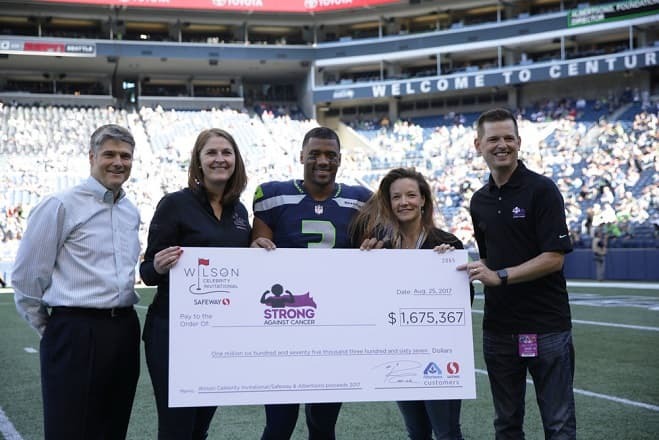 He also raises awareness of many diseases, and is a regular visitor of Seattle Children Hospital. In an interview he said: ‘My mom (Tammy) grew up as an ER nurse, when I was growing up she was an ER nurse, was always in hospitals. My dad was a diabetic who passed away from diabetes. They were always in a hospital, for whatever reason.’ This left its mark on him and now he wants to help other patients and their families and bring more joy to their lives. He is very active on Instagram and Twitter. He usually posts pictures of his family or pictures from the gym or his football practice. His fans can follow him on Instagram where he has more than 3.5 million followers. His current net worth is around $120 million. In 2015, he became one of the highest paid players, because the Seahawks extended his contract for $87.6 million. His average salary is ‎$21,900,000. The future is bright for this NFL player who spent a week playing baseball with the New York Yankees in order to learn new things that could help him in his football career. He is eating a well-balanced diet, and with the help of his personal chef he wants to be able to play football even when he is 45. In 2012, he was named “Pepsi Rookie of the Week” and “NFL Rookie of the Year” for his debut season. In 2013, at the end of the season, he had a score of 26 touchdown passes and 9 interceptions. By the 13th week, it was his second time to be honored with “NFC Offensive player of the Week” award. In 2016, he also got the title “Pro Bowl Offensive MVP”. Even though he suffered a new hamstring injury in September 2018, he is always ready to put his all into every game.